You are going to Watch RWBY Volume 2 Episode 7 online free episodes with HQ / high quality. 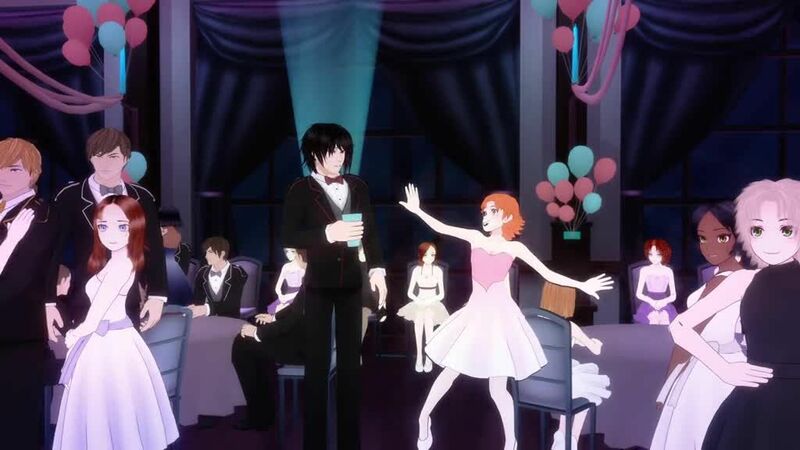 Stream cartoons RWBY Episode 17 Online As the dance progresses, Jaune learns from Ruby that Weiss and Neptune did not come together so he decides to try again with her. He spots Pyrrha leaving the ballroom and speaks with her, learning no one asked her, intimidated by the fame she has gained. Jaune speaks to Neptune, who admits he didn’t come with Weiss because he can’t dance, but Jaune encourages him to speak with her. Jaune returns to the dance wearing a dress, as per as promise he made a few episodes earlier, should no one ask Pyrrha out. As Team JNPR leads the party, Ruby steps outside and spots a disguised Cinder vaulting over the rooftops. Cinder breaks into the CCT tower and hacks into the network, only for Ruby to arrive followed by Ironwood after they discover the guards have been knocked out. Cinder escapes back to the dance without notice.